The star that makes life possible! Thirst for knowledge about the Sun has existed since humans could think. Long ago, many civilizations even thought the Sun was God! The Sun is a star just like any of the stars you see when you look up into the night sky. Some bigger, some smaller, some younger, and some older. Many of these stars are the center of their own solar systems. Our Sun keeps all surrounding objects in orbit by its pull of gravity. Stars are enormous balls of gas. At the center (or core) of a star is where "nuclear fusion" takes place. This produces the energy that provides the light and heat necessary to sustain life on Earth. So even on really hot days, be thankful our star is there, because without it... we wouldn't be! 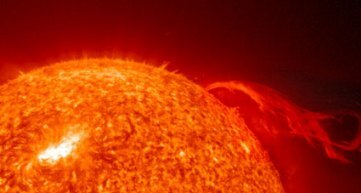 Scientists believe the Sun is over 4.5 billion years old and is about half-way through its life cycle. As the Sun ages it will increase in size. 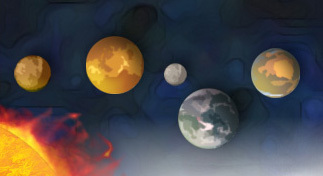 The inner planets of our solar system will eventually burn up from the heat, including Earth. At the end of the Sun's life cycle it will turn into a White Dwarf star, and eventually it will explode! Did you know the Sun is sort of on the small side when compared to other stars? It only looks so massive because it is the closest star to Earth. It takes 8 minutes for light from the Sun to reach Earth. The next closest star is the Proxima Centauri, in the constellation Centaurus, which is over 4.2 light years away! Small in comparison, but still so HUGE! When compared to the Earth, the Sun is enormous. Check out these size comparison models. It has been estimated that more than 1 million Earths could fit inside the Sun!